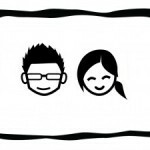 I came across the Star Newspaper in Malaysia recently reported on a creative marriage proposal at Penang Starwalk 2008. 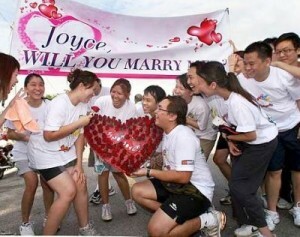 Joyce Lee got a big surprise when she crossed the finished line as her boyfriend, Simon Tan with a marriage proposal. Simon surprised Joyce with a romantic and touching banner stated – “Joyce, Will You Marry Me?” which was carried by their colleagues. Check out the picture below. Joyce nodded and accepted the ring which was slipped on her finger by Simon. According to Simon, he chose Penang Starwalk as a place for marriage proposal due to the day is the fifth anniversary of their courtship. “I walked ahead so I could prepare myself for the proposal”. Guys/Girls, is the story above touching? Have any creative idea about marriage proposal, spill it out using the comment form below. what a great way to propose…and its a lovely move..
just imagine how this guy had to make sure he got ahead first..
*hope he could catch a breath before proposing…or shes the one that’s out of breath after he propose..